Fairfield, a residential and industrial suburb east of Northcote, is 6 km north-east of central Melbourne. 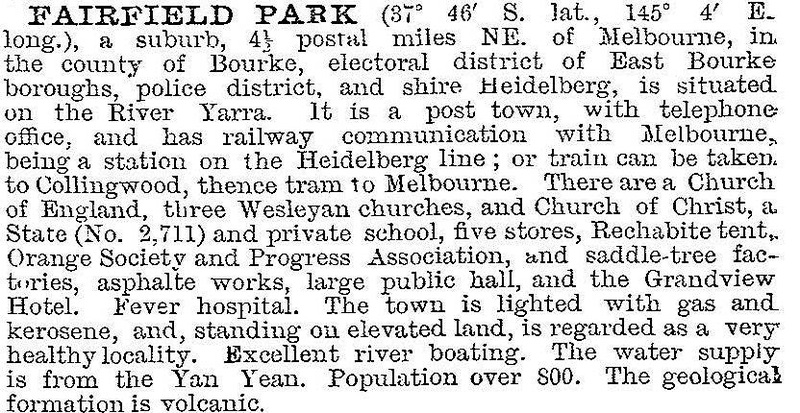 It includes a southerly portion surrounded on three sides by meanders of the Merri Creek and the Yarra River, chiefly consisting of open space and once containing institutions dating from colonial times, notably the Yarra Bend asylum. In 1888 the railway line through Fairfield Park, from Collingwood to Heidelberg, was opened, and Fairfield Park was the junction of the Outer Circle railway from Oakleigh (1891-93). James also had a tram service along Station Street, from the station to Mansfield Street running from 1884 to 1890, connected to the railway line that between 1884 and 1888 ran only from Clifton Hill to Alphington (the line from ‘no where to no where’). Fairfield was thus launched with a high degree of attention to public access, and the house blocks sold well. They were reasonable value for money in that they were bigger than the standard blocks closer to Melbourne. Fairfield's other place of settlement was at Yarra Bend, where in 1848 the Metropolitan Lunatic Asylum was opened. By the 1860s it housed over 1000 people, with on-site growing of food and its own bootmaker. The second institution to open at Yarra Bend was the Queen's Memorial Infectious Diseases Hospital (1904), or the Fever Hospital. The Hospital was to the north of the present Eastern Freeway and the Asylum mostly to the south. A portion of the Asylum immediately north of the freeway became Fairlea Women's Prison, 1925-96. The balance of the Asylum buildings and grounds are now occupied by a public golf course, open space and sports ovals. Apart from the riverside meanders which have mudstone adjoining them on the Fairfield side, all of Fairfield is on basaltic land. Consequently it did not have brick-claypits like neighbouring Northcote, and only one quarry at its northern edge. Fairfield thus developed as a mixture of comfortable residences – usually timber – and light industrial uses. The flood-prone Fairfield Flat was drained in 1907-08. Station Street became the main shopping strip and by the mid-1920s had a mature range of shops and the Park picture theatre. The Fairfield North Primary school (actually in Thornbury south), opened in 1928. South of Heidelberg Road there is Fairfield Park with an oval and other sports facilities. At the river's edge there is the Fairfield Boat House and an amphitheatre (1985). The opening of the amphitheatre coincided with the revival of the Boat House and canoeing on the river. Further south the Women's prison and the Infectious Diseases Hospital were closed in 1996. Both closures caused controversy: the prison on the grounds that women experience discrimination in mixed-gender prisons and the hospital because of the breaking up of expertise and research facilities. In February 1997, approval was given to build the Victorian Institute for Forensic Psychiatry (later Victorian Institute of Forensic Mental Health) on the hospital site. The facility, named the Thomas Embling Hospital, is an asylum for the criminally insane and was opened in 2000. It is adjoined by a campus of the Northern Melbourne Institute of TAFE. In 1987 the median house price in Fairfield was the same as the median for metropolitan Melbourne and in 1996 it was 37% above the metropolitan median.